This is the discharge from Pugh's Adit, one of several discharges from Cwmystwyth Mine that continue to pollute the Afon Ystwth several decades after the mine was abandoned. 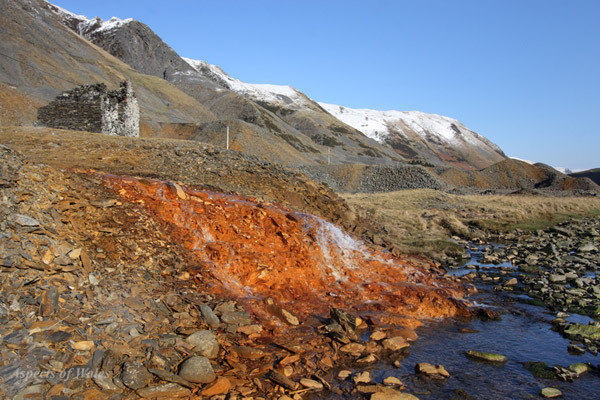 The orange staining is due to the precipitation of iron hydroxide, but the water also contains high concentrations of dissolved lead and zinc, which are of greater consequence to the fish and other river life in the Ystwyth. Mining has been carried out for lead, zinc and silver in this valley since Roman times, with production reaching its peak in the 18th century. This photo was taken around mid-day in early February 2012 at NGR SN8011174395. Canon EOS 40D, Canon EF-S 10-22mm lens at 19mm, Manfrotto tripod. Exposure F11 at 1/125 sec. Original image in Raw format.